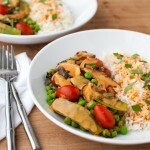 I love a good Thai curry but no one else in my family does so I don’t get to make it as often as I would like. Since the kids are away this week (at camp and on a school trip), I decided it would be a good time to cook up a batch of vegetable curry. It was also time to clean out the vegetable drawer in my refrigerator. There are all kinds of reasons to love this vegetable curry. It is loaded with healthy vegetables. It is quick and easy to make. And it is very tasty. But on a very practical note, it is also a great way to use up whatever vegetables may be languishing at the back of the refrigerator. Let’s be honest, I often go to the grocery store with BIG plans and buy way more produce than I should. I have the best of intentions to use everything. However, life does not always go as planned and I end up with an array of vegetables in various states of freshness. Fortunately, I can put those vegetables to good use and have a great meal in the end. Heat 1/4 cup of coconut cream in a medium saucepan or wok over medium heat. Simmer the cream until it begins to separate and a layer of oil forms on the surface, 4-5 minutes. Add the curry paste, stir to combine, and cook until fragrant, 1-2 minutes. Add the coconut milk, broth, fish sauce, brown sugar, basil, and lime leaves. Stir to combine and bring to a boil. Add the mushroom and snow peas; simmer until vegetables are tender. Add the green peas and tomatoes and cook until they are just heated through. Remove from heat. Taste and adjust the seasonings as desired. Serve with steamed rice. To get the coconut cream, put the can of coconut milk in the refrigerator for about an hour. Then, carefully open the can and spoon off the thick layer of cream from the top. Stir the remaining coconut milk to use in the rest of the recipe. You can use any combination of vegetables depending on personal preference and what you have on hand. I also like to use carrots, sweet potatoes, and bell peppers. Kaffir lime leaves are available at most Asian grocery stores. Any unused leaves can be stored in the freezer for several months. Recipe adapted from Nicole Routhier’s Fragrant Thai Curries cooking class.